Tag line: "Between Heaven and Hell There's Always Hollywood!" At the 1991 Cannes Film Festival, Joel and Ethan Coen’s Barton Fink walked off with the coveted Palme d’Or, the prize given to the festival’s best film. Joel Coen would also win for Best Director, while star John Turturro snatched up the acting award. This was a first in the history of Cannes: never before had a single motion picture won the festival’s top three prizes. Roman Polanski, who served as Jury President that year, said there was plenty of debate when it came time to decide the winners in many other categories, but the decision to name Barton Fink best film was unanimous. 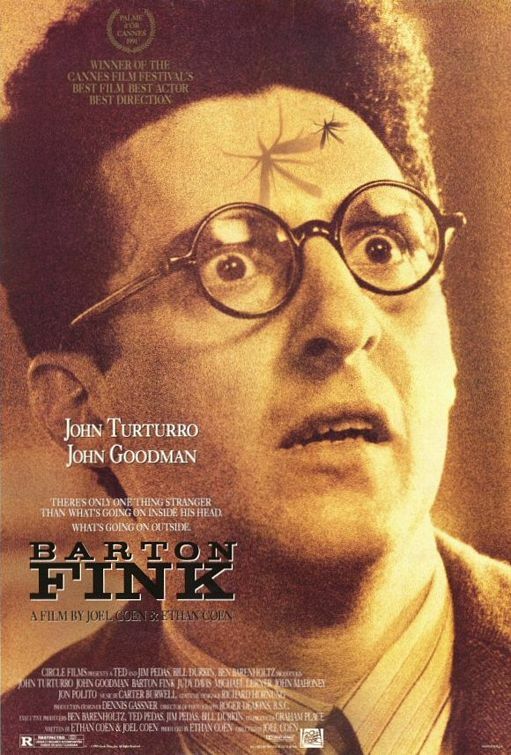 It’s 1941, and Barton Fink (John Turturro), a successful New York playwright, travels to Los Angeles to accept a job writing for the movies. Hired by Capital Pictures, his first assignment is to pen a script for a wrestling picture that’ll star Wallace Beery. After meeting with studio head Jack Lipnick (Michael Lerner), Fink returns to his tiny hotel room to begin writing. He sits down at his typewriter, composes an opening sentence…and freezes; the victim of a severe case of writer’s block. He spends days trying to break out of his rut, and, at one point, drops in on an alcoholic screenwriter (John Mahoney) and his girlfriend (Judy Davis), hoping they’ll provide the inspiration he so desperately needs. Alas, nothing seems to work, not even a chat with Charlie Meadows (John Goodman), the outgoing salesman staying in the room next door. In desperation, Fink makes one last ditch effort to set his muse free, a drastic measure that brings about an incredible turn of events. Before long, writer’s block is the least of Barton Fink’s problems. John Turturro shines as the lead character, an intellectual writer who considers himself the voice of the common man, despite the fact he never actually listens to what anyone, including the ‘common man’, has to say. John Goodman continues his string of successes with the Coens by delivering a strong performance as Charlie Meadows, the always-upbeat insurance salesman whose friendly smile might be hiding a terrible secret. Michael Lerner was nominated for an Academy Award for his turn as Lipnick, the fast-talking studio head who doesn’t waste time worrying about the details, but it’s Tony Shalhoub, playing producer Ben Geisler, who practically steals the show, a man who remains a step ahead of everyone around him, even when they’re two steps behind. With murders that go unexplained and hallways blazing with the fires of hell, the world of Barton Fink is, at times, a frightening place. Much like the product Hollywood turns out on a regular basis, nothing here is as it seems, and poor Barton Fink is nearly swallowed up by the chaos surrounding him. The film’s tagline is “Between Heaven and Hell, there’s always Hollywood”, and by the time Barton Fink is over, you’ll see this statement is more accurate than you would have ever imagined. One of the few Coen Brothers movies I didn't like. I liked it ok up till the lady looses her head, then it's pretty much all downhill from there. I loved every moment that Michael Learner was on screen so much that I might be willing to watch it again. How did I miss this one. I have to find it. Thanks.